Fresno, CA-Trail-Gear, Inc. re-released their Rock Sliders for 1997-2006 Jeep Wranglers (TJ models) today (Friday, May 11, 2012). Trail-Gear has redesigned their TJ Rock Slider and is now offering them at a better price than before. Rock Sliders or Rockers Guards are used to provide protection to the rocker panels of vehicles. Trail-Gear’s TJ Rocker Guards and TJ Rock Sliders have been developed specifically to work with the TJ model of Jeep Wrangler. Trail-Gear’s heavy duty Rocker Guards and Rock Sliders are designed to take a pounding from the rocks while keeping body damage to a minimum, allowing Jeeps to slide over or between rocks on even the hardest trails without damage. 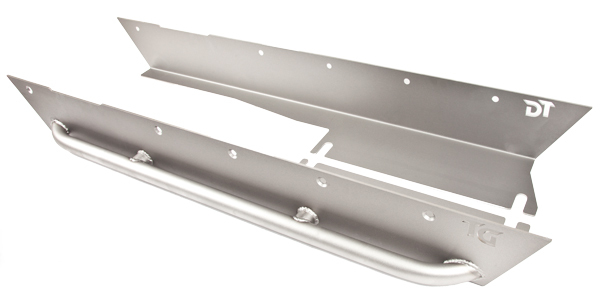 Trail- Gear’s TJ Rocker Guards are made from 3/16” heavy plate steel. The TJ Rock Sliders use the same 3/16” heavy plate steel with an added Rock Tube for additional side protection that can also be used as a step. The Rock Tubes are 1 ½” OD x .120 wall 1035 DOM tubing. Trail-Gear stopped production of Jeep Rock Sliders in October 2011 to improve the design. The Trail-Gear engineering team redesigned the TJ Rock Slider by lowering the Rock Tubes to offer better protection and to double as a step for entering and exiting the vehicle. Trail-Gear TJ Rocker Guards and TJ Rock Sliders are strong enough to hold the entire weight of the truck. A high-lift jack can be used anywhere along the guard or slider for repositioning the rig on the trail, or simply high-lifting it up for repairs. TJ Rocker Guards and TJ Rock Sliders are sold in pairs and shipped raw. Both kits include all necessary fastening hardware. Interested parties may purchase Trail-Gear TJ Rocker Guards and Trail-Gear TJ Rock Sliders from any authorized Trail-Gear dealer or from the Trail-Gear website (www.trail-gear.com). The TJ Rocker Guards retail for $149 and the TJ Rock Sliders retail for $199 on the Trail-Gear website. All design and development for the TJ Rocker Guards and TJ Rock Sliders was done at the Trail- Gear, Inc. world headquarters in Fresno, California. Trail-Gear, Inc. exhaustively tests all their products at some of the world’s hardest courses, such as “The Hammers” in Johnson Valley, California and the Rubicon Trail in Lake Tahoe, California.